The Ben Nevis 10 years old is produced by the Japanese company Nikka, owning the distillery from the Highlands since 1989. 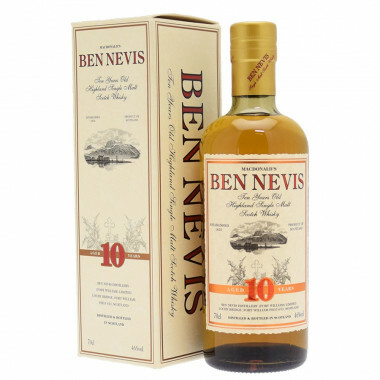 Ben Nevis is a Scottish distillery which gets its name from the highest mountain of the United Kingdom. This historic distillery has been purchased in 1989 and belongs today to the Japanese company The Nikka Whisky Distilling Company which produces the famous Nikka whisky. The Ben Nevis 10 years old, bottled in small amounts, is especially sold for the Japanese market. This dry and powerful Single Malt is a true Highlander! A whisky for connoisseurs, with fresh notes of iodine and fruit. Colour: amber-coloured with golden hints. Nose: fresh and dry. Very much scented with aromas of orange peel, walnut and soft spices. It reveals the softness of malted barley. Palate: dry and powerful. A herbaceous and spicy style (dark chocolate and orange). A hint of clove. Finish: long, with salted notes (of iodine) and tobacco.